London is home to some of the country's poorest and richest wards, and improving health, including mental health, in the most disadvantaged areas is a major public health challenge. 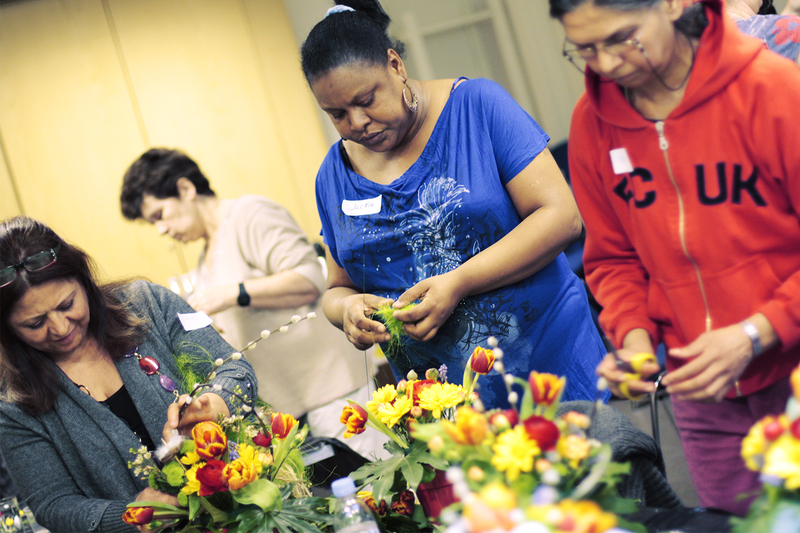 Since 2007, Well Communities (formerly called Well London) has been one of the most ambitious and radical attempts in the UK to develop a community development model that enhances the health and wellbeing of disadvantaged communities. It has been developed over two phases through work with 33 London neighbourhoods across 20 boroughs, supported by funding from the Big Lottery. Well Communities, now in phase 3, provides a framework for communities and local grassroots organisations to work together to improve health and well-being, build resilience and reduce inequalities. The framework is designed to be embedded as a mainstream approach, a ‘different way of working’, rather than a fixed term intervention. It adds value to what’s already going on ensuring that what is delivered for the community is cost effective. The Well London approach is two pronged. Core “Heart of the Community” projects, including DIY Happiness, provide capacity and build knowledge, skills and confidence. Action on specific local needs and issues is taken forward through themed activities and projects determined by the needs and issues identified by each community, through the community engagement process. These can include cultural and arts activities, and projects to improve healthy eating, physical activity, mental health, and local environments. Well London was developed over two phases. In Phase 1, it was delivered in 20 of the most deprived neighbourhoods with a total target population of 35,000, by the multi-sectoral Well London Alliance. Phase 2 saw programmes commissioned locally and ran in 10 areas across 9 boroughs. Each neighbourhood developed a unique programme designed to maximise the use of existing assets and meet the needs and wishes of local residents. DIY Happiness is one of the core “Heart of the Community” Well Communities projects. In phase 1 a free eight week Do-It-Yourself Happiness workshop course explored what really made women happy. It helped women to relax and enjoy some ‘me’ time; improving their ability to cope with life's ups and downs by increasing resilience; reducing stress; feel more optimistic about the future and come up with their own well-being tips that could be shared with others. The aim for phase 3 of Well Communities is to see the framework approach scaled up and embedded as part of mainstream services in some London boroughs and piloted in rural, semi urban and other urban areas in other parts of the country. There is a new logo and branding and a new website www.wellcommunities.org.uk will go live in the next few months. There are plans to link the programme into primary and secondary care to look at how it can support people with long term conditions. The evaluation considered impact at several levels: individual participant level, project level, programme level, community level and whole population wide level. Over 35,000 people have participated in Well London, and there is strong qualitative evidence of important positive impacts for those who participated directly in the programme activities on a range of health and well-being indicators. In phase 2, 82% of participants reported that they were more physically active, 54% reported increased mental well-being and 31% reported increased social connectedness. Other outcomes included people progressing to paid employment, improved community spaces and increased capacity of the local community and voluntary sector, with 60% saying they were volunteering more as a result. Areas where there were higher levels of exposure to the intervention showed some significantly better outcomes at the wider population level.